Virtual eXtended LAN (VXLAN) is a network virtualization scheme that overlays Layer 2 over Layer 3. VXLAN uses Layer 3 multicast to support the transmission of multicast and broadcast traffic in the virtual network, while decoupling the virtual network from the physical infrastructure. VXLAN uses a UDP-based encapsulation to tunnel Ethernet frames. 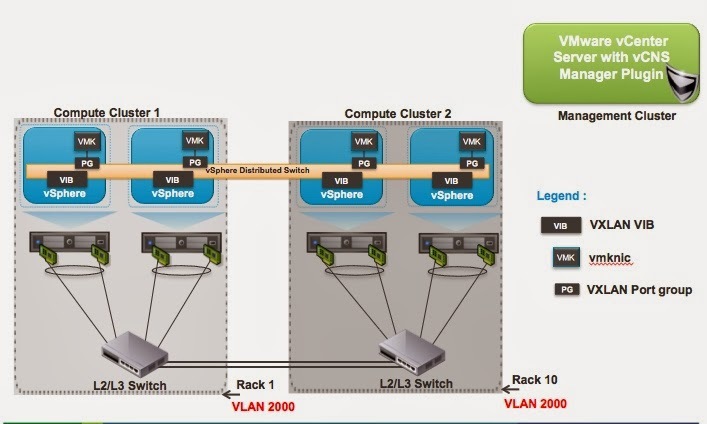 In a VMware environment, VXLAN can extend the virtual network across a set of VMware ESXi servers, providing Layer 2 connectivity among the hosted virtual machines (VMs). Each VMware ESXI server represents a VXLAN Tunnel Endpoint. In this environment, a VXLAN gateway device can be used to terminate the VXLAN tunnel and forward traffic to and from a physical network. A VXLAN gateway bridges traffic between VXLAN and non-VXLAN environments. The BIG-IP system uses a VXLAN gateway to bridge a traditional VLAN and a VXLAN network, by becoming a virtual network endpoint. A VXLAN segment is a Layer 2 overlay network over which VMs communicate. Only VMs within the same VXLAN segment can communicate with each other. The Virtual Network Identifier (VNI) is also called the VXLAN segment ID. The system uses the VNI, along with the VLAN ID, to identify the appropriate tunnel. The VXLAN Tunnel Endpoint (VTEP) originates or terminates a VXLAN tunnel. The same local IP address can be used for multiple tunnels. In addition to the UDP header, encapsulated packets include a VXLAN header, which carries a 24-bit VNI to uniquely identify Layer 2 segments within the overlay.